What is IBM Electronic Services? Why do I need it? Where do you get it? When and how do you use it? How will this help you electronic support relationship with IBM? 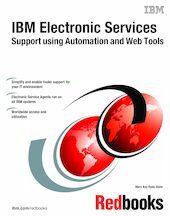 Find the answers to these questions and more details about IBM Electronic Services in this IBM Redbooks publication. The goal of IBM Electronic Services is to simplify your support relationship to make it easier and faster to do business with IBM. Through automation and Internet access, Electronic Services integrates the IBM Support community with your company staff and your IT environment. The two major components are IBM Electronic Service Agent™ (Service Agent) and the IBM Electronic Services Web site. IBM Electronic Services reaches across all IBM systems in all countries or regions where IBM does business. Electronic Services can provide the electronic support relationship for a single machine environment or a multinational complex of many servers. This book is intended for IT management, system operators, and other people who work for and with IBM clients. Prior to reading this book, you need to have a thorough understanding of your computer system and networking environments.